Fig. 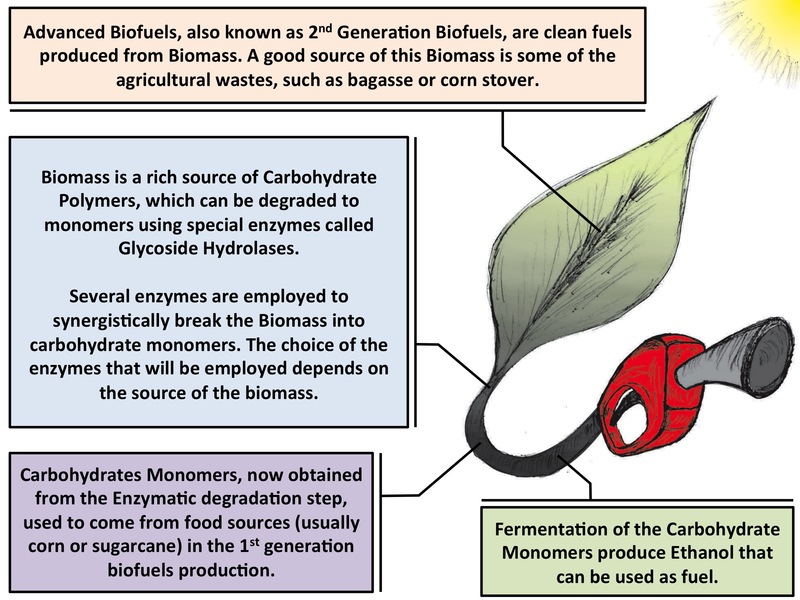 1 - Illustration of the second-generation biofuel production process. The development of more efficient enzymes is a key point of where molecular dynamics can contribute. Greenhouse gas accumulation in the atmosphere, caused by the large consumption of fossil-derived fuels, coupled with the reduction of the world's supply of these fuels, has lead to increased interest in identifying novel sources of energy. Biofuels, produced from crops such as corn, represent an alternative energy source, however, their competition with food production results in an ethical dilemma. Fortunately, a solution is offered by second-generation biofuels, which can be produced from plant cell wall polysaccharides derived from agricultural waste, or biomass. Over the years, several technologies have been developed for the conversion of biomass to fermentable sugars, and future efforts aim to make this process cost-competitive in the present-day market. 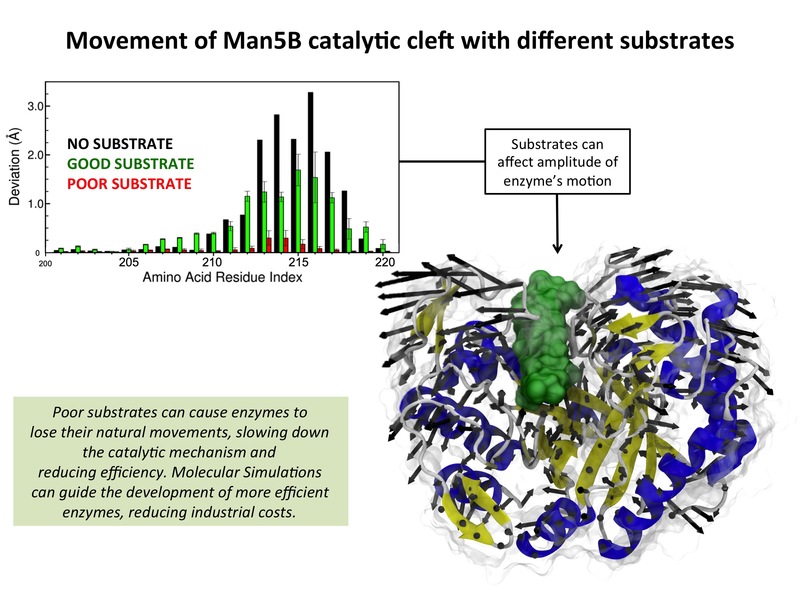 Through molecular dynamics study of Caldanaerobius polysaccharolyticus Man5B, an industrially important enzyme that cleaves both β-﻿1,4 glucosidic and β-﻿1,4 mannosidic linkages in biomass, we identified the mechanism of unsuitable substrate inhibition. Representative cleavage products cellohexose and mannohexose were docked into the Man5B catalytic site, and simulations of these model complexes indicated a notable loss of enzyme flexibility for the gluco-oligosaccharide cellohexose, as compared to the manno-oligosaccharide mannohexose. These results, combined with evidence from previous experimental studies, suggested that reduction of catalytic efficiency is related to the loss of enzyme flexibility in the presence of gluco-oligosaccharides, which serves to inhibit binding of new suitable substrates. Manno-oligosacchardies do not constrain enzyme flexibility, and thus do not inhibit substrate binding. Our conclusions are supported by kinetic experiments that demonstrate gluco-oligosacharides take much longer to exit the catalytic pocket, thus preventing new substrates from reaching the active site. Fig. 3 - Illustration of the Cellulosome structure. Some bacteria employ a biomass degradation strategy based on large enzymatic complexes, which incorporate multiple enzymes working synergistically toward catalytic processing. These complexes, called cellulosomes, offer a promising approach to reduce biofuel production costs. Further, because cellulosomes are typically found in harsh natural environments, they have evolved ultra-stable structural characteristics that suggest novel biotechnological applications. Cellulosomes represent extracellular proteinaceous assemblages comprised of a scaffolding backbone, onto which cohesion-containing modules for carbohydrate binding and catalytic activity are appended. Because the various modules exhibit a plethora of binding and enzymatic activities that facilitate cleavage of plant cell wall polysaccharides, the cellulosome serves as a virtual "Swiss army knife" for biomass degradation. It is reported that Clostridium thermocellum, the most studied cellulosomal organism, has one of the highest rates of cellulose utilization known in nature. It's cellulosomal system displays a specific activity against crystalline cellulose that is 50-fold higher than the analogous non-cellulosomal system in the fungus Trichoderma reesei. In order to better understand the efficient biomass degradation mechanisms of cellulosomal machineries, as well as their unique structural integrity, it is first necessary to study the interactions and attachment modes of the various subunits, and their process of synergistic action. We are currently collaborating with experimentalists in USA, Germany, and Israel to unravel the structure and catalytic functions of cellulosomes. Cellulosomes are formed by interactions of dockerins (Doc) and cohesins (Coh) that are connected by flexible linkers made of proteins with just a few to more than a thousand amino acids. The many flexible linker regions allow for very complex structural dynamics. Some insight into cellulosome dynamics can be gained by determining possible conformations through the use of enhanced sampling methods. GSAFold, the implementation of Generalized Simulated Annealing (GSA) in NAMD, is employed here to explore conformations of the linker region. 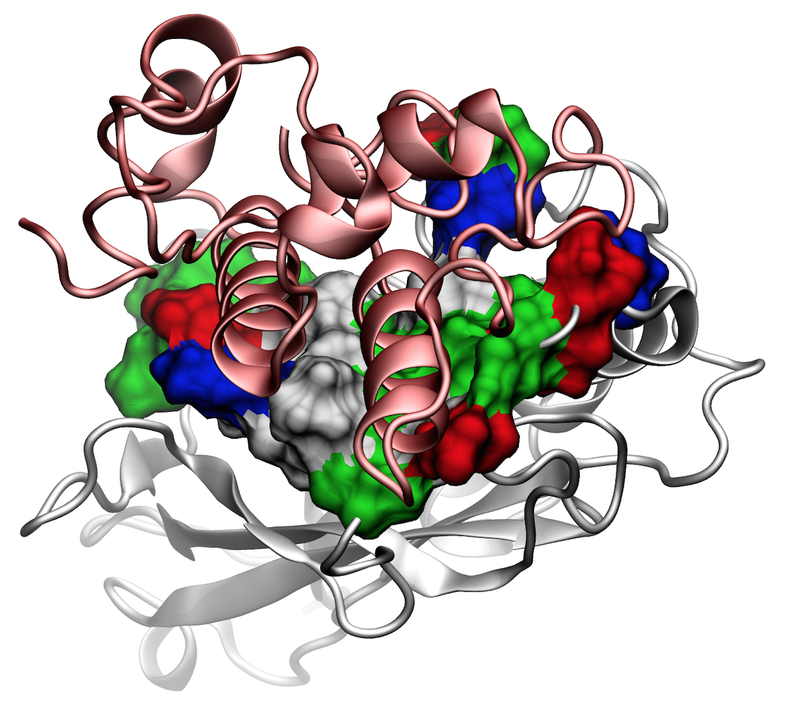 The structure used in the present simulation is from the Protein Data Bank (ID code 3KCP). The stochastic calculation with GSAFold, where only the linker region was allowed to rotate show that the system is most likely to be found in two conformations, see Figure 4. 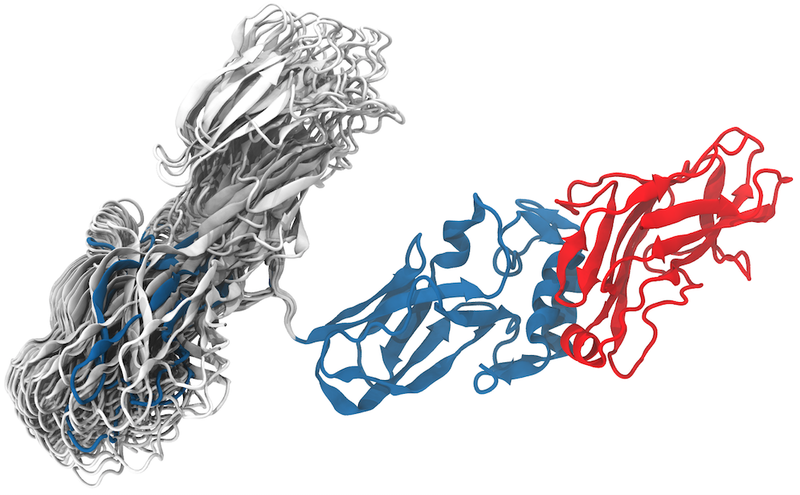 Simulations reveal a tolerance to the positioning of the module in both conformations, which allows the cellulosome modules to adjust the large enzymatic domains attached to the type I cohesin. The results show that, even though very flexible, the linker led the type I Coh module to two preferred positions, with about 2/3 occurrences of the "native" conformation, as seen in the crystal structure, and 1/3 occurrences of the "alternate" conformation. The short flexible linker, one of the shortest in the C. thermocellum cellulosome, appears to have the function of keeping the system in two major conformations and not completely random ones as one might have expected. Read more on Biochimica et Biophysica Acta . Fig. 5 - Illustration of celllosome environment. Animation adapted from Sasha Dale work. Challenging environments have guided nature in the development of ultrastable protein complexes, and cellulosomes are usually found in inhospitable circumstances. While network assembly of these large enzymatic complexes is enabled by protein interactions with commonplace affinities, it was found that certain cellulosomal ligand-receptor interactions exhibit extreme resistance to applied force (read more). Employing state-of-the-art single-molecule atomic force microscope techniques and steered molecular dynamics simulations our group was able to characterize the ligand-receptor complex responsible for substrate anchoring in the Ruminococcus flavefaciens cellulosome, see Figure 5. The complex withstands forces of 600-750 pN, making it one of the strongest bimolecular interactions reported, equivalent to half the mechanical strength of a covalent bond. Our findings, recently published on Nature Communications , demonstrate force activation and inter-domain stabilization of the complex, and suggest that certain network components serve as mechanical effectors for maintaining network integrity. The detailed understanding of cellulosomal network components may help in the development of biocatalysts for production of fuels and chemicals from renewable plant-derived biomass. To elucidate the molecular mechanisms at play that enable the extreme mechanostability, steered molecular dynamics (SMD) simulations can be employed. The N-terminus of XMod-Doc was harmonically restrained while the C-terminus of Coh was pulled away at constant speed. SMD results showed the force increased with distance until the complex ruptured for all simulations. At the slowest pulling speed of 0.25 Å/ns the rupture occurred at a peak force of approximately 900 pN. 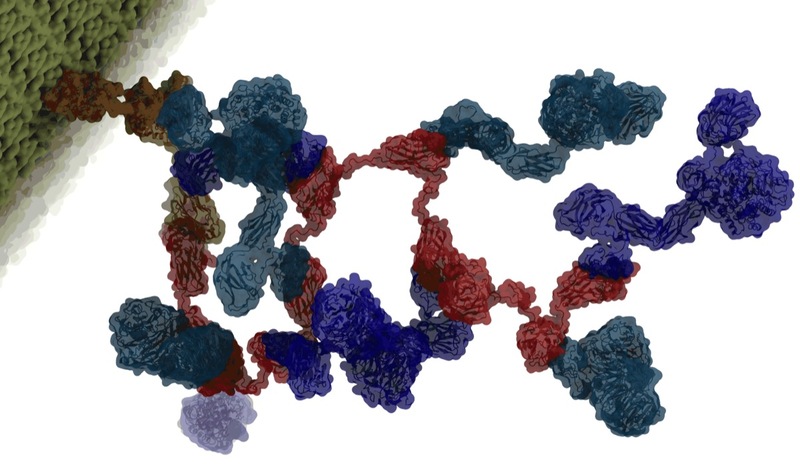 Molecular dynamics identified that the binding interface (see Figure 6) consisting of a hydrophobic centre (grey) surrounded by a ring of polar (green) and charged residues (blue, positive; red, negative). This residue pattern suggests the hydrophilic side chains protect the interior hydrophobic core from attack by water molecules, compensating for the flat binding interface that lacks a deep pocket. The geometry suggests a penalty to unbinding that stabilizes the bound state. Analysis of the contact surface areas of interacting residues shows that total contact area increase throughout the simulation due to rearrangement of the interacting residues when the complex is mechanically stressed,see Figure 7. Doc residues in the simulated binding interface clamped down on Coh residues upon mechanical loading, resulting in increased stability and decreased accessibility of water into the hydrophobic core of the bound complex. Page created and maintained by Rafael Bernardi, Jodi Hadden and Joao Ribeiro. Contact Us // Material on this page is copyrighted; contact Webmaster for more information. // Document last modified on 05 Feb 2015 // 7461 accesses since 02 Sep 2014 .